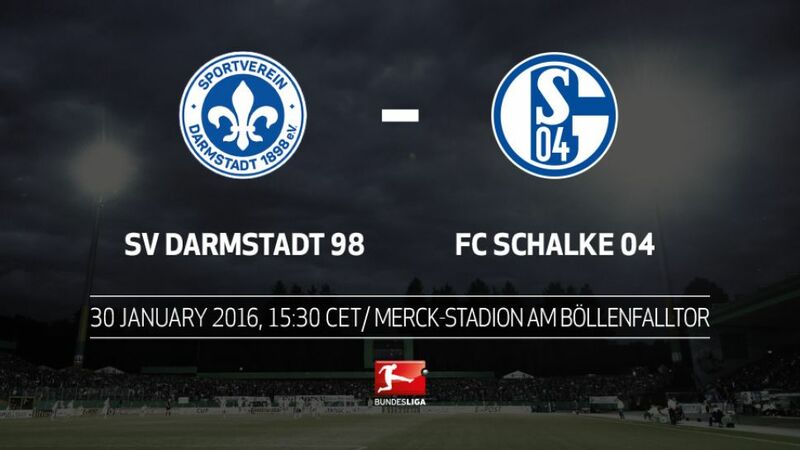 FC Schalke 04 are hoping to gather the momentum needed for a tilt at a top-four finish when they travel to a buoyant SV Darmstadt 98 on Saturday afternoon (kick-off 15:30CET/14:30GMT). The Royal Blues threw away the lead to lose 3-1 at home to SV Werder Bremen last weekend, but need to find their rhythm sooner rather than later if they are to push for one of the coveted UEFA Champions League qualifying places. They will not have things all their own way, however, as promoted side Darmstadt are notoriously resilient at the back and dangerous going forward, as they showed with an impressive 2-1 victory away to Hannover 96 on Matchday 18. Darmstadt have only won once at home all season.However, the hosts can take heart from the fact Schalke have only earned one point from their last four away matches in the Bundesliga.Lilies striker Sandro Wagner has been directly involved in four goals in the club's last two league outings. Darmstadt coach Dirk Schuster has only ever beaten Schalke once in 13 attempts during his Bundesliga career as a player and as a coach.Schalke have only conceded one goal fewer than Darmstadt so far this season.